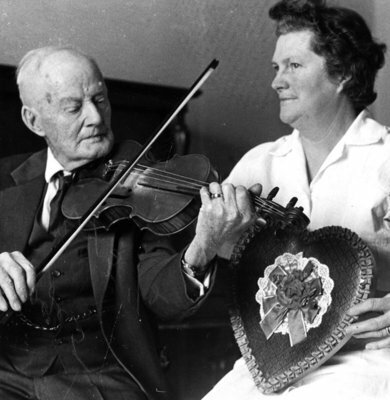 A black and white photograph of Warner Woodruff Lynde playing the fiddle for Fairview Lodge Nurse's Aide Mrs. Donald Cawker. Warner Woodruff Lynde (1869-1969) was born in Whitby Township on February 14, 1869 and lived in the Brooklin-Ashburn area all his life. He was a farmer, who retired in 1948 after farming for 60 years. He was an accomplished fiddle player and was still playing music at the age of 99. Mr. Lynde moved to Fairview Lodge, Whitby, from his home on the seventh concession of Whitby Township, in January 1968 and died there on May 2, 1969, at the age of 100 years. In this picture, he is playing "The Soldier's Joy" on the fiddle for Fairview Lodge's Nurse's Aide Mrs. Donald Cawker, one day before his 99th birthday. Warner Woodruff Lynde, February 13, 1968. The Oshawa Times. Whitby Archives 31-009-623.